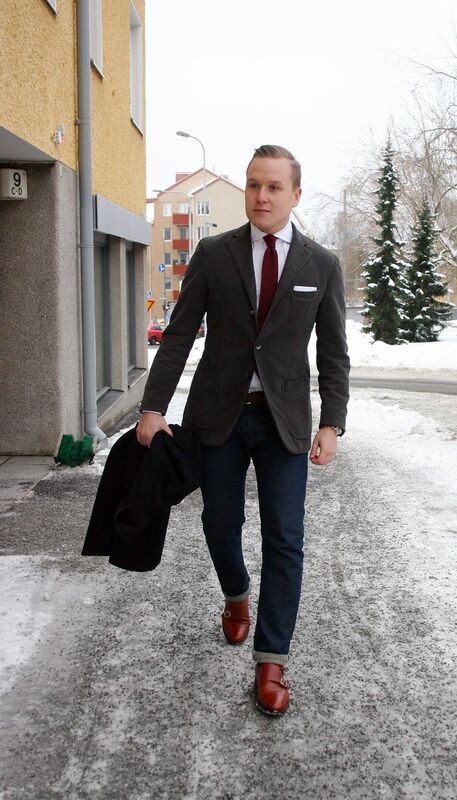 A good example of a semi-casual outfit that uses fabrics and textures fit for the season. Pictures taken on a Friday a few weeks ago, in a nice and kind of warmer winter day. Items include a dark green unstructured moleskin jacket from L.B.M. 1911, white oxford cotton spread collar shirt from SuitSupply, cardinal red shetland wool knit tie from Berg & Berg, white cotton pocket square, Equus Leather Oak Brown bridle leather belt, dark raw denim from Indigofera / Nollakolme Tampere, dark red melange wool socks from Berg & Berg and Meermin Scotch grain double monks with heavy rubber soles. What I'm especially fond of is the cardinal red shetland knit tie that comes with a round end as opposite to the square end found in most knit ties. The color and the texture is perfect for winter and it ties a perfect knot. 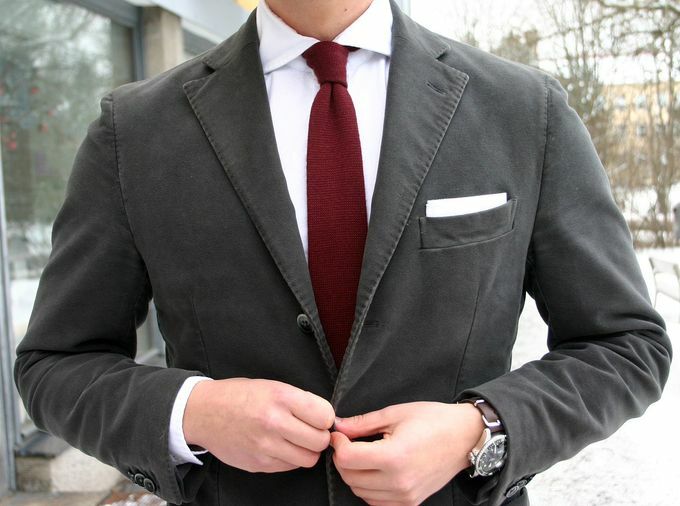 It also provides a great touch of color to the outfit without screaming for attention. It is, however, the kind of tie you wouldn't use with a very dressy shirt. The washed and winter weight oxford cotton here is a great example of what does work, though.